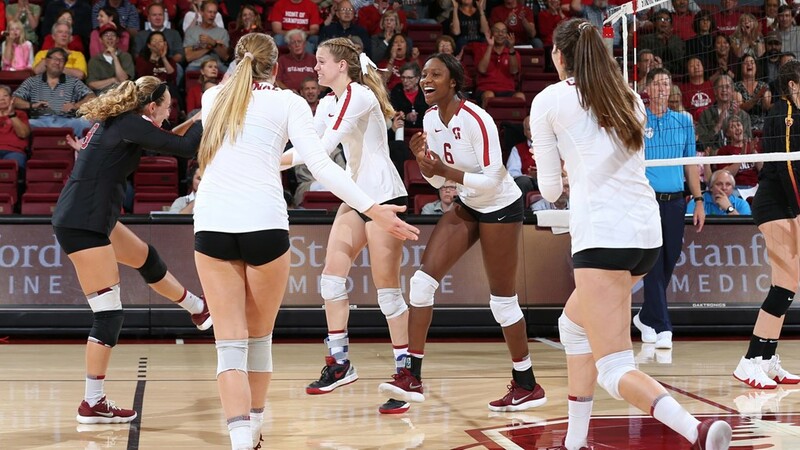 STANFORD, Calif. – Playing in their final regular season match at Maples Pavilion, the Stanford seniors led the Cardinal to a 3-0 sweep over California on Saturday. The win was the 26th straight for Stanford (28-1, 20-0 Pac-12), which became the first team since USC in 2003 to go undefeated in Pac-12 Conference play. It was the Cardinal’s 14th consecutive victory over Cal (15-16, 7-13 Pac-12) and its 32nd straight win at Maples Pavilion. Senior middle blocker Courtney Bowen tied for a match-high with 11 kills on .450 hitting to go with three blocks. Sophomore Meghan McClure also notched 11 kills to go with five digs and three blocks. Senior middle blocker Tami Alade finished with five kills on .375 hitting and a match-high eight blocks. As a team, Stanford hit .265 and held Cal to a .137 clip. The Cardinal recorded 11.5 team blocks, while both teams finished with three aces. Junior setter Jenna Gray dished out 37 assists and finished with four digs, two blocks and two aces. Junior libero Morgan Hentz has 10 digs, two assists and an ace. Junior opposite Audriana Fitzmorris had eight kills on a .333 attack percentage and three blocks for Stanford. Outside hitter Kathryn Plummer had an off night offensively, with seven kills and seven hitting errors. The junior did rack up eight digs and four blocks. Senior Alexis Froistad started the match for Fitzmorris. The middle blocker has been sidelined for much of her career with injuries. Senior setter Payton Chang is redshirting this season and plans to graduate and transfer for her final year of eligibility. Cal was led by sophomore Mima Mirkovic‘s eight kills and eight digs, while Preslie Anderson hit .308 with seven kills and three blocks. Stanford awaits its postseason fate, which will be revealed Sunday on the NCAA Selection Show on ESPNU at 5:30 p.m.
STANFORD, Calif. – A night at the Farm closed with a disappointing 3-0 (23-25, 21-25, 19-25) loss that did not tell the hard-fought story of the match or the year as the Golden Bears concluded a notable 2018 season. While California (15-16, 7-13 Pac-12) was outhit 43-35, it managed to hold the No. 2 Stanford Cardinal (28-1, 20-0 Pac-12) to a .265 hitting percentage, shy of its .306 season average. Cal was led by Mima Mirkovic‘s eight kills, which helped force 24 tie scores on Saturday night. Trio Lauren Forte, Bailee Huizenga and Maddie Haynes added six kills apiece, against the 2018 conference champions, while Preslie Anderson also contributed seven kills on the night. Departing senior Mackenzie Albrecht led the game with 13 digs in her final appearance at Maples Pavilion. The Bears fell for the 14th consecutive time to the Cardinal, who went undefeated in Pac-12 play this season and will host the first round of the NCAA playoffs, which begin on Nov. 30. The night opened with a closely-contested first set with seven lead changes and 15 knotted scores. Cal led by as much as three, but Stanford pulled in a 4-1 run to take the first set. Both teams collected 16 kills apiece, but the Bears erred twice more than the Cardinal squad and were less efficient finishing with a .244 hitting clip, compared to Stanford’s .324. Set 2 provided a bit less parity as the Cardinal led the entire way outhitting the Bears 17-11. However, midway through the score was once again knotted at 17-17 after Isabel Potter served her 32nd ace of the season. Bailee Huizenga added three more kills after that point to keep Cal in the conversation, but the Cardinal outscored the Bears 8-3 from the point. A season where the Golden Bears were picked to finish last in the Pac-12 preseason poll, stunned many as first-time head coach Jennifer Dorr led the Bears to their most noteworthy season since 2013 and in several categories even longer. Its 10th-place finish in the league is the highest finish in in that stretch. Cal hit several benchmarks including its most overall wins (15), most conference wins (7) and most league sweeps (3) since 2013, while earning its most conference victories over ranked opponents (4) since 2011. The Bears picked up the program’s first win over 20th ranked UCLA in five seasons, also snapping losing streaks against Utah (since 2015) and Oregon State (since 2014) with demonstrable sweeps. Win one in the Bears-Utes series was Cal’s first Pac-12 win of the season and changed the course of the year, clipping a five-game losing streak. The sweep marked the first over Utah since 2011. That energy carried over into a pair of straight-set wins over the Beavers, which is only the sixth time since 2010 that the Bears have not given up a set when they swept. Potentially Cal’s biggest upset of the season came in a 3-1 win in Pullman, Wash., as the Bears not only clinched the series against an 18th-ranked Washington State, but downed their highest ranked opponent of the season. It was Cal’s first win in Pullman since 2014 and first series victory since 2012. The Bears competitiveness was found in a collective effort, with consistent play from standouts Mima Mirkovic who finished the season with 15 double doubles, pacing Cal with 405 kills and 359 digs, middle tandem Lauren Forte and Preslie Anderson who topped the conference in several categories and Isabel Potter, who became the Bears’ primary setter, controlled the offense with a 5-1 system giving the Bears consistency they needed. Potter finished 10th in conference in assists per set (7.12) and also contributing a team-high in aces. Forte ranked fourth in the league in blocks per set (1.25) and ninth in hitting efficiency (.339), while Anderson ranked fourth in attacking percentage (.367). Tempe, Ariz., native, Forte also picked up the Bears lone individual award of the season being named Pac-12 Freshman of the Week on Oct. 22. Forte impressed throughout the season, highlighted by a season-high 11.0 total blocks against No. 21 Washington State, which is the most blocks in a single game for the Bears since 2012 when Kat Brown recorded 12.0 blocks on Nov. 8, also against Wazzu. Anderson of Chandler, Ariz., also pegged a .706 attacking percentage, recording 12 kills, against a 13th-ranked USC on Sept. 30. Her performance marked the first time a player has recorded at least a .700 clip and at least 10 kills in a single game since 2016 when Jenelle Jordan recorded a .786 percentage and 11 kills against Southern Utah on Aug. 26. It is also the first time since 2012 that a Bear has recorded such a performance against a Pac-12 team. Then, Christina Higgins recorded a .714 percentage at Arizona on Sept.
30 when she tallied 10 kills. Cal will open up a full national search for head coach as Dorr completes her one-year contract in the position. Dorr assumed the role in an interim capacity with four games remaining in 2017 and signed on to lead the Bears for the 2018 season. Should Dorr apply, she will be considered for the position. A standout setter at Hawai’i, Dorr has been with the program since 2009, when she came on as a director of operations under legendary coach Rich Feller. In 2011, the Laguna Beach, Calif., native, was promoted to assistant coach.